Mobile business printers are more popular than you would think; Mobile photo printers not so much. Why? Well, it’s because mobile photo printers aren’t suited to a lot of people. Both of them are strictly niche categories, which means that only a few types of people would find them really useful. In fact, the entire concept of a mobile photo printer sounds a lot like a public relations gimmick and counterproductive? After all, mobile printing is something that you would think is most required by businessmen and professionals on the move. It doesn’t matter, though. Canon is the master brand for photo printing. So, it is only logical for them to come up with the photo version of a new market segment. We haven’t reviewed mobile photo printers before but we have reviewed other printer models with the same printing technology from this Original Equipment Manufacturer (OEM). 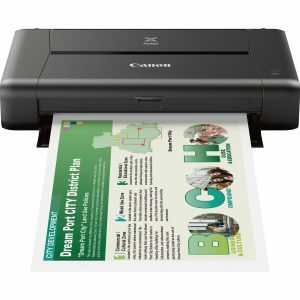 The latest example was the Canon Pixma iP8760 – an A3 photo inkjet printer. The device on the review table today is the Canon Pixma iP110. It is similar to the iP8760, except that it is a mobile inkjet photo printer that can print up to letter and legal sizes of paper. As explained above, the mobile printing device segment is dominated by business printers i.e. 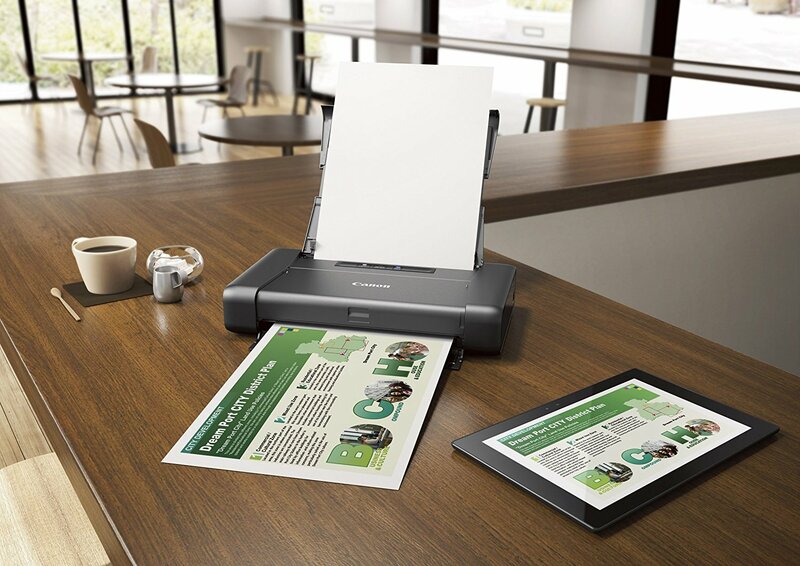 printers that perform better while printing documents and text than photos. The Canon Pixma iP110 is the opposite because it specialised in photos. Here’s our review. If you were to evaluate the output quality of other mobile printing devices in the market, you’ll find that they perform much better with text and documents than photos. The logic is that there just isn’t any need for mobile printers to be good at printing photos. Canon doesn’t think so, which is why the Canon Pixma iP110 specialises in photos. 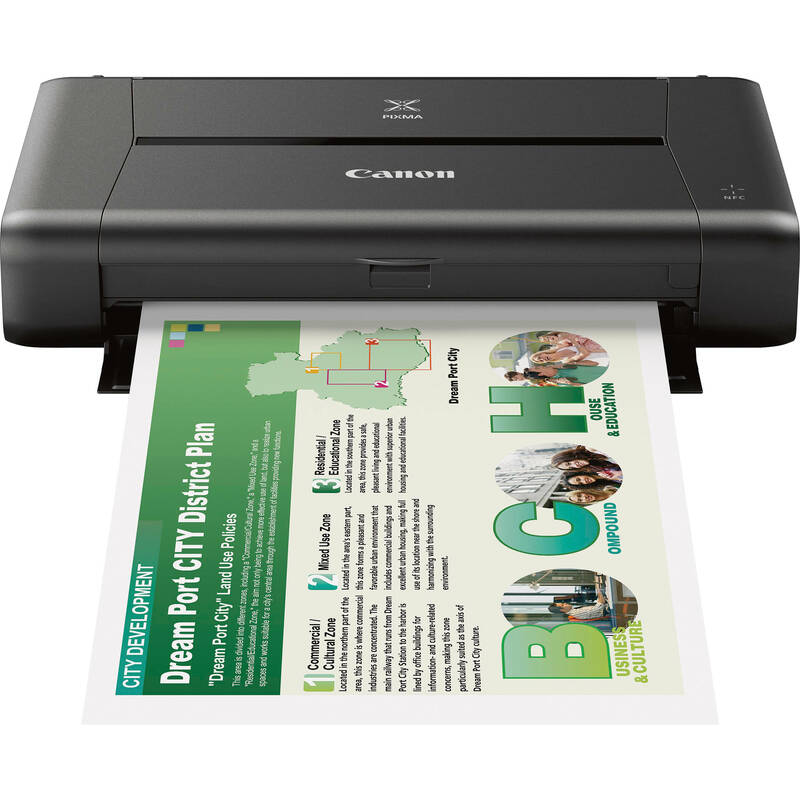 If you want to print photos on the go, then you won’t find many better devices than the Canon Pixma iP110. If you print text with this device, the best you can hope for is laser quality. This device prints photos so exceptionally on the back of its maximum printing resolution of 9600 x 2400 dots per inch (dpi). Another technological element that adds to the output quality of this device is its print engine. The Full-photolithography Inkjet Nozzle Engineering (FINE) technology allows for 1 picolitre droplets to be generated. The small droplet size means greater clarity of the image. The practical result is lab quality images. Exceptional photo quality on the move is rare which is why the portability factor of the Canon Pixma iP110 is its biggest strength. This device puts others like it to shame because of its small size, low weight, and associated durability. The device measures only 322mm wide, 185mm deep, and 62mm high. While this size doesn’t mean that you put this device in your laptop bag, it does mean that it’ll fit into your backpack. It doesn’t even weigh much at only 2 Kg. The best part, though, is that this device is also very durable. If there is one thing that mobile devices need, then it is connectivity and the Canon Pixma iP110 doesn’t disappoint. 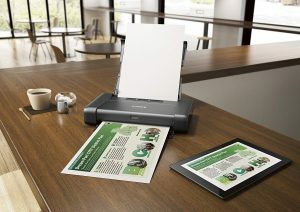 You can connect the iP110 to your printing device through either USB 2.0 or Wi-Fi which is dubbed as the “infrastructure” mode. That’s not all either; Canon has also provided its own rendition of Wi-Fi Direct in the form of the “Access Point” mode. The functionality of this mode is the same as that of Wi-Fi Direct, which means greater flexibility for you. As it is, the Canon Pixma iP110 is compatible with a number of mobile platforms and third party services. These include Apple AirPrint and Google Cloud Print. 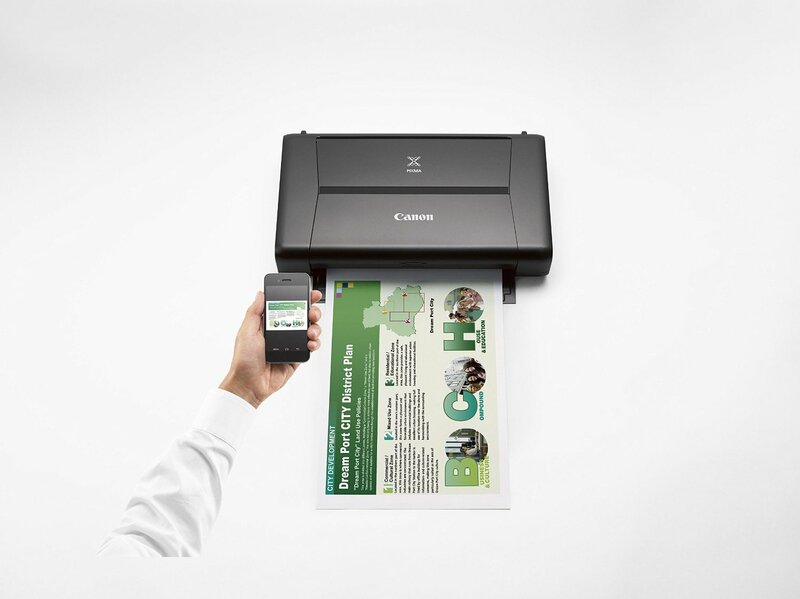 The device also supports Canon Pixma Printing Solutions, which opens connectivity options for Evernote, Photobucket, Twitter, Facebook, Dropbox, Microsoft One Drive, and Google Drive. The Canon Pixma iP110 is not meant for heavy volume printing. This is evident in a number of its features. However, these features can also be seen as limitations of this device. The first of these is the paper handling capacity of the device. The iP110 is only capable of handling a maximum of 50 sheets at a time. 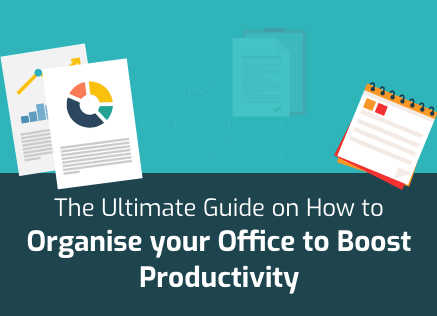 It is highly unlikely, though, that you’re going to need to print more than 50 sheets at a time on the road, regardless of which industry you’re involved in. Another element that shows that the Canon Pixma iP110 is not meant for heavy duty printing is its running cost. You need to be prepared that this device will cost you a pretty penny. You can expect to pay around 40.5 cents for every page you print with the iP110. This cost is with genuine or OEM cartridges, though. 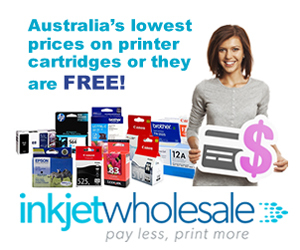 If you were to use generic cartridges then your cost will drop down to 31.7 cents per page, which is still very high. High running costs are generally the norm with inkjet printers. When you add mobility and excellent output quality, the running cost rises above the norm. 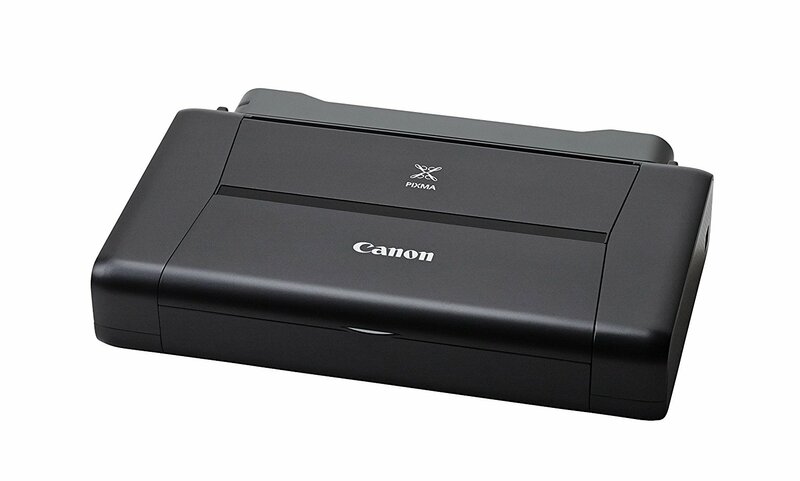 At the same time, the Canon Pixma iP110 is expensive to run because of the ink system it follows. In order to keep the size small, Canon has used a 2-cartridge system in this device. Even so, they needed to provide lab quality photos. This they have done by having a 5-ink system. As a result, you have one multicolour cartridge comprising black, yellow, magenta, and cyan colour inks and one containing pigment black ink. Unfortunately, this system results in ink wastage because if one colour empties in the multicolour cartridge, the entire cartridge needs to be replaced. The value proposition of the Canon Pixma iP110 is mobility. This is possible but only if you have rechargeable batteries. You can’t expect to be mobile if you have to depend on a power outlet all the time. Therefore, rechargeable batteries become important. The problem is the battery pack is an add-on and quite expensive. If you buy from the company you can expect to pay 60-70 percent more on the initial cost of the printer. The biggest feature that we haven’t talked about till now is print speed. The reason why it wasn’t mentioned in either strengths or weaknesses was that it is neither. The print speed of this device is decidedly mediocre and at par with other devices in the market. The device is rated to produce 20 monochrome pages per minute (ppm) while the print speed goes down to 14 ppm for colour prints. Keeping the device small must’ve posed lots of challenges to the OEM. You can see it in the way they reduced the size of the control panel section. The control panel of this device is very basic. It has some simple buttons but doesn’t have either LED or LCD screens. One very cool feature that Canon has added is the automatic turn-on feature. This means that when you send a print to this device, it will turn on to print it automatically. The Canon Pixma iP110 also comes with some software programmes such as Full HD Movie Printing, Creative Park, and My Image Garden.